Audiologist in Calgary: We Now Provide Home Visits! If you or your family member has been waiting to improve your hearing because of difficulties with mobility or getting to our clinic, you will be happy to know that Audiology Innovations in Calgary recently started offering home visits to patients. When we attended the fall 2017 Kerby expo in September of this year and shared this offering to other healthcare workers, agencies and staff, it was very well received. We now want to ensure family members of those with hearing loss are aware that these services are available as well from our audiologists. Contact us today for more information! Why are we providing this service? We feel it is important to reduce the barriers for our patients to access high-quality hearing health care, so we invested in portable equipment for both evaluating hearing thoroughly and providing hearing aid fittings and follow up. Many of the seniors agencies such as “Silvera for Seniors” are very appreciative of this service. We were hand-selected to be one of a small group of high-quality health care providers to deliver services to each of Silvera’s communities and have proof of our police clearances for the vulnerable population. Elan, one of our experienced clinicians, goes to each of the Silvera communities regularly. If you live in one of their communities, speak with the front desk staff to find out when he is coming or give our offices a call and we are happy to let you know when he can arrange to be there next. If you live in a different agency seniors residence, let us know and we will arrange to visit you there and we often provide an orientation of our services to the management and staff. Or if you or your family member with hearing loss are in your own home, an audiologist from Audiology Innovations can come there as well. Just give us a call and we will arrange the rest. Family members are also grateful for these mobile services as it can take some of the load off of them for transporting their family to and from the multiple appointments that we offer to ensure the best success of hearing aid provision. Finally, through our ongoing work in the community at community events and educational seminars, we have made excellent contacts who provide other mobile healthcare services in the dental hygiene, denture, homecare and senior planning areas if you need assistance in these areas but have trouble getting out of your place of residence to access these services. 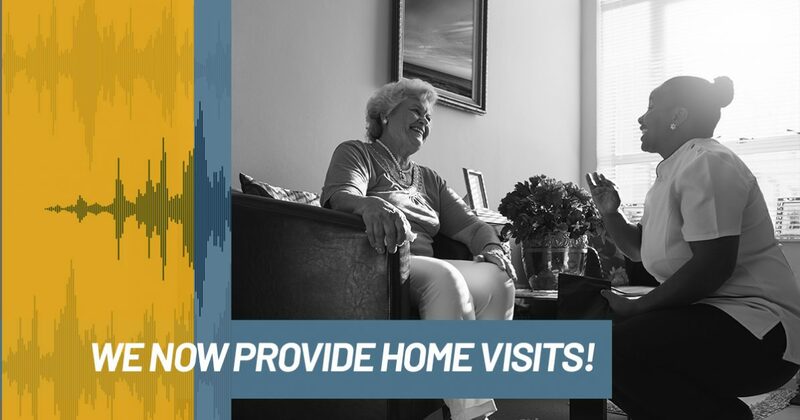 If you’re interested in our home visits, call us for more information at (403) 252-4722 or fill out our online form.